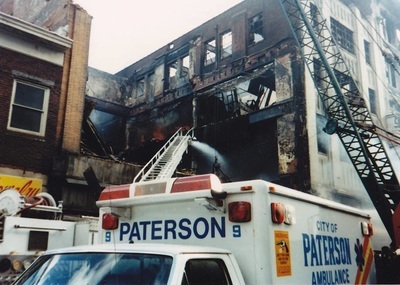 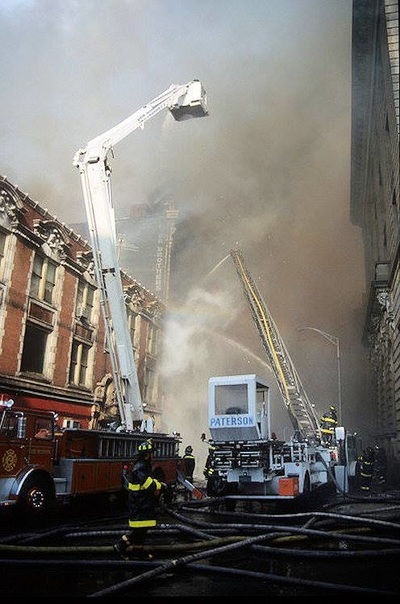 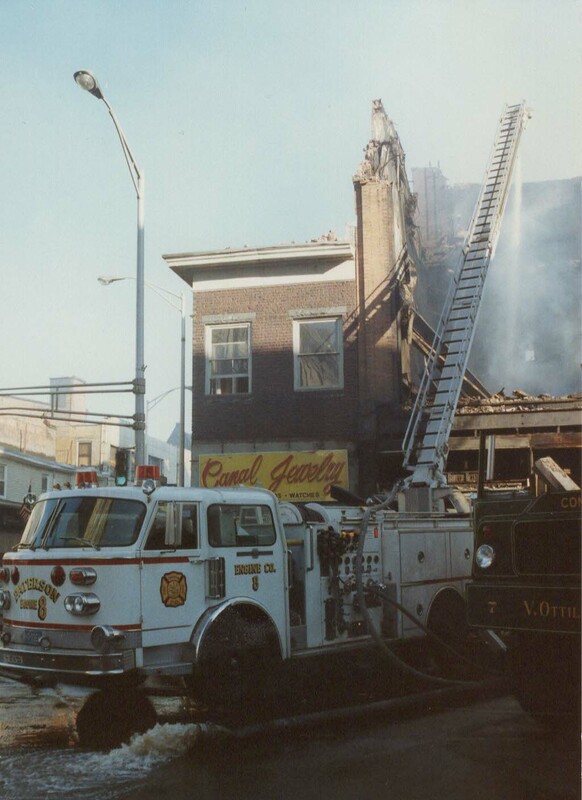 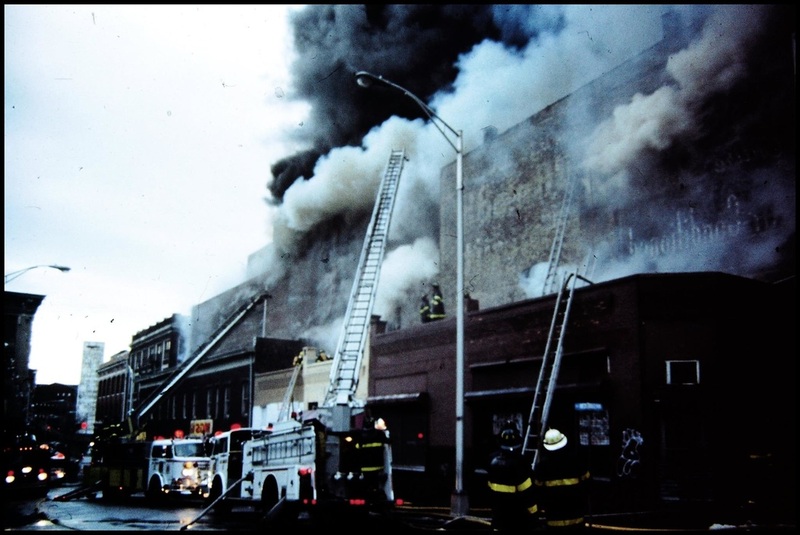 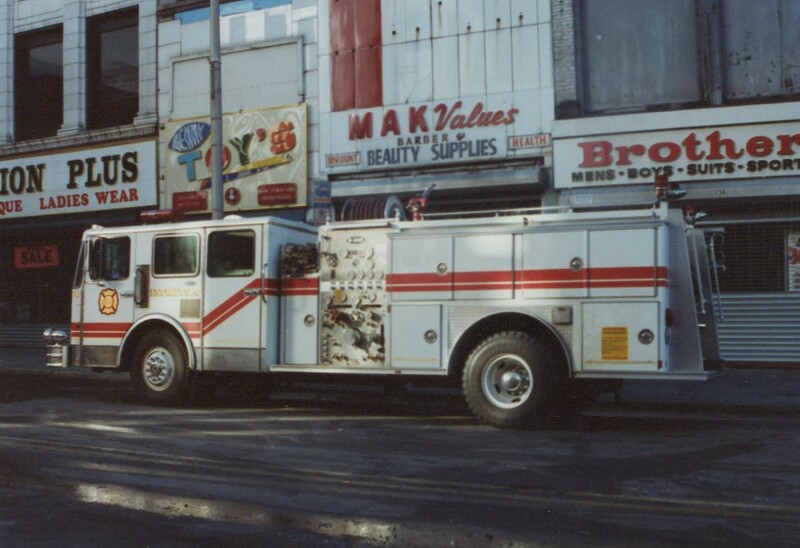 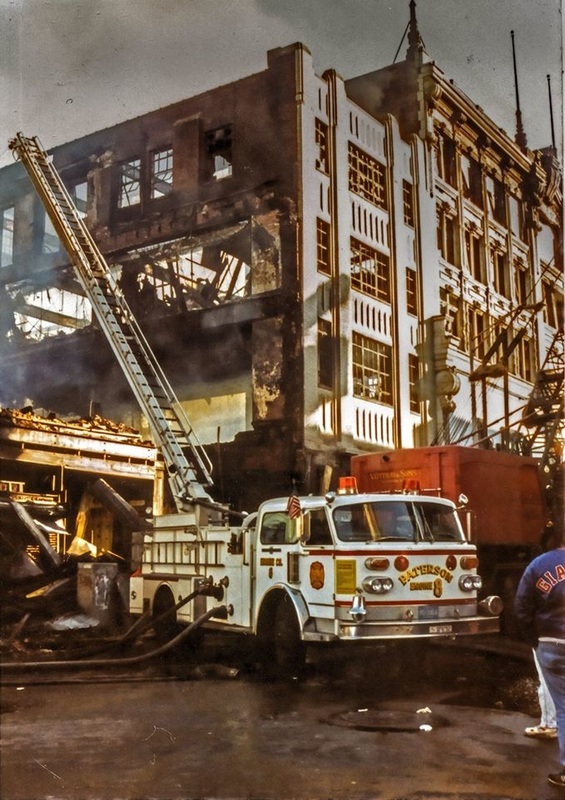 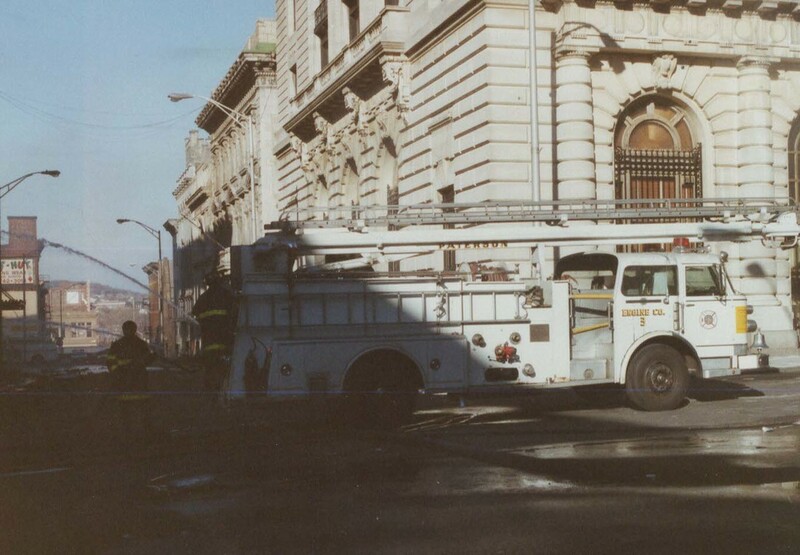 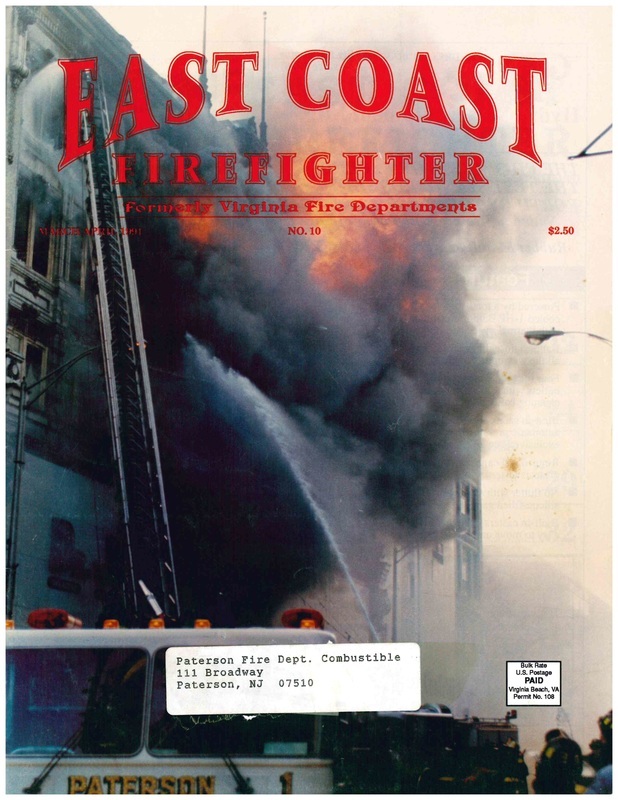 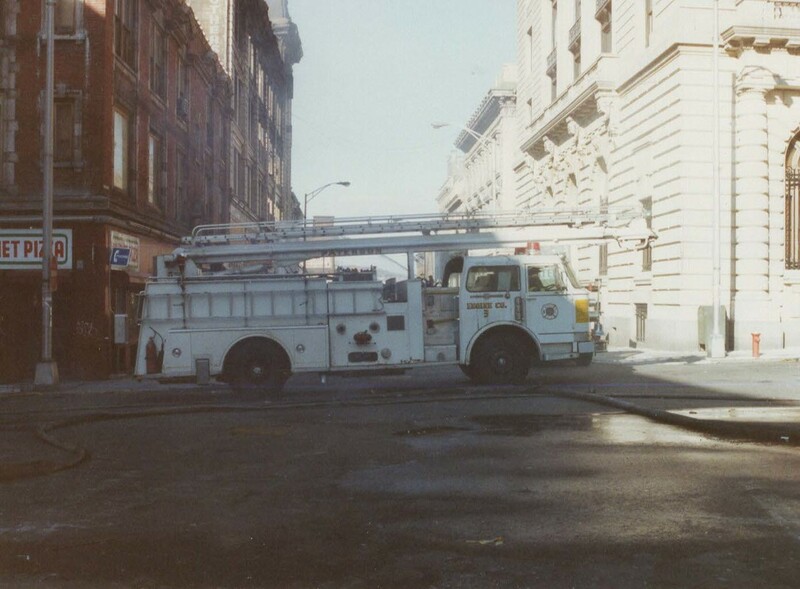 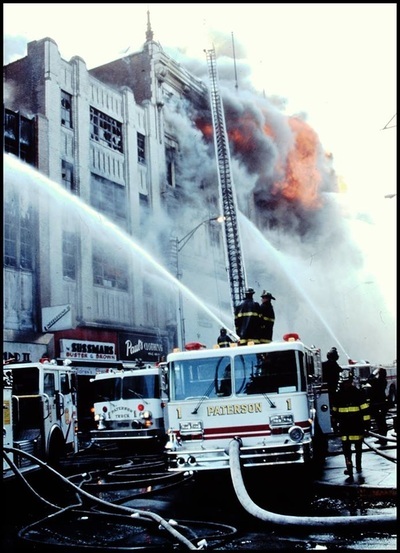 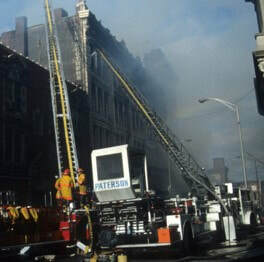 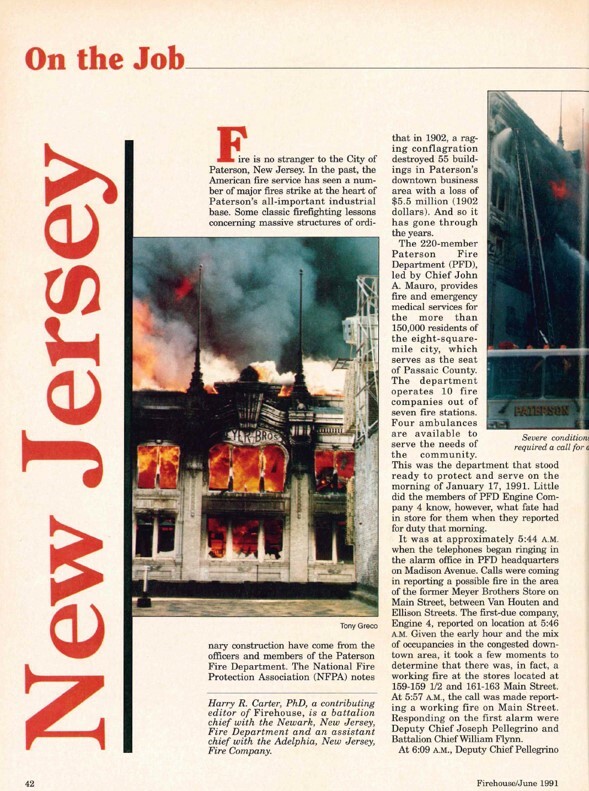 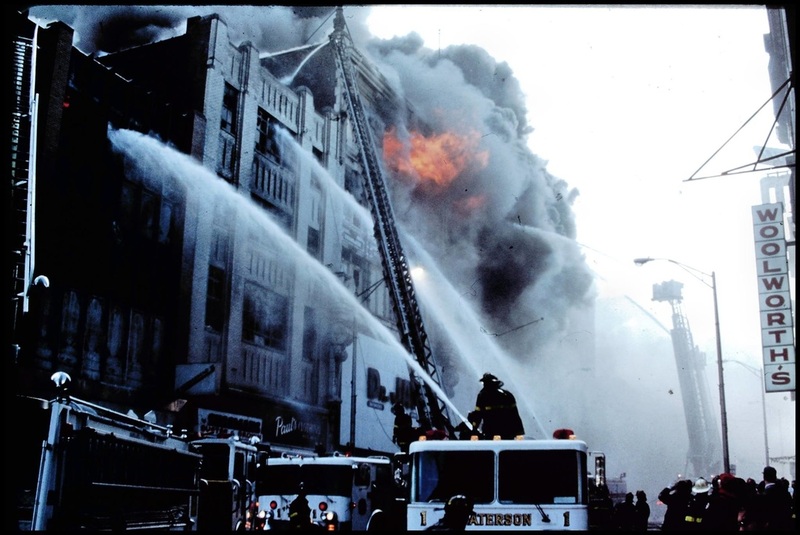 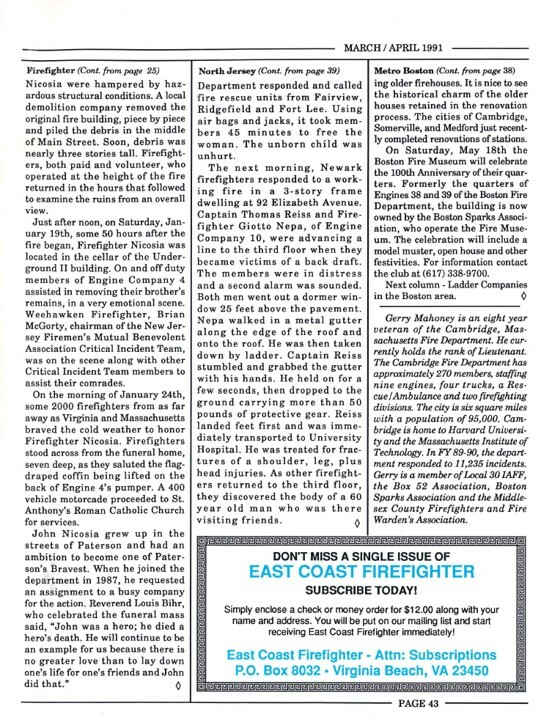 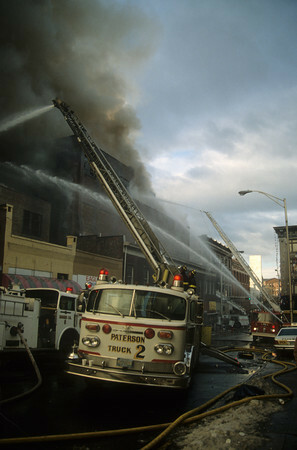 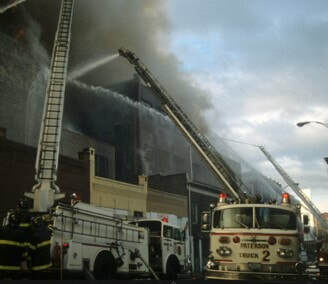 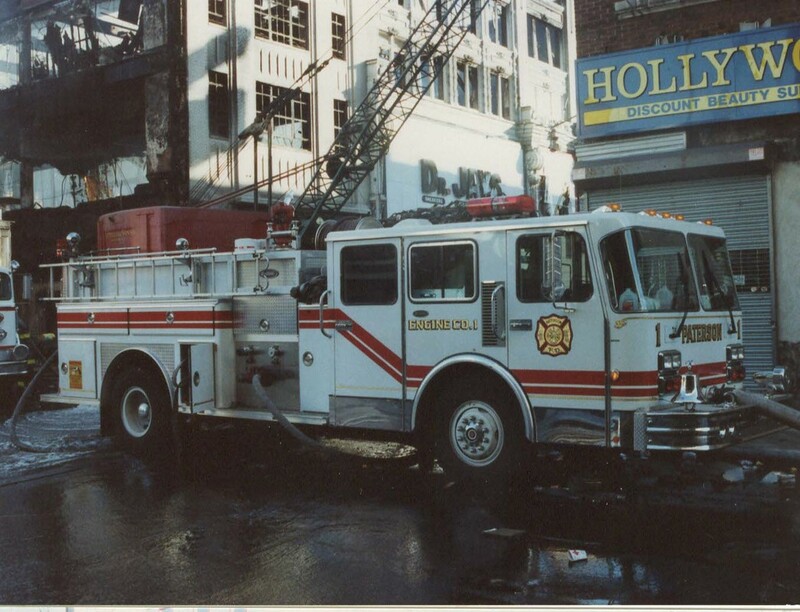 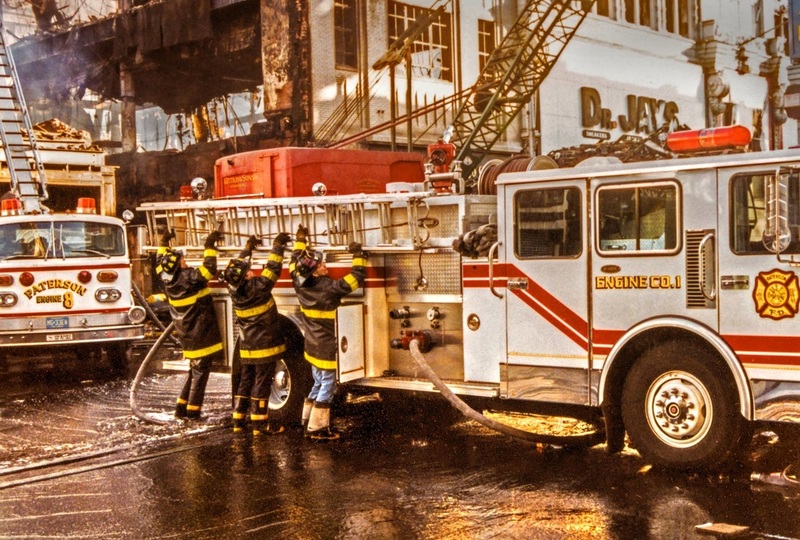 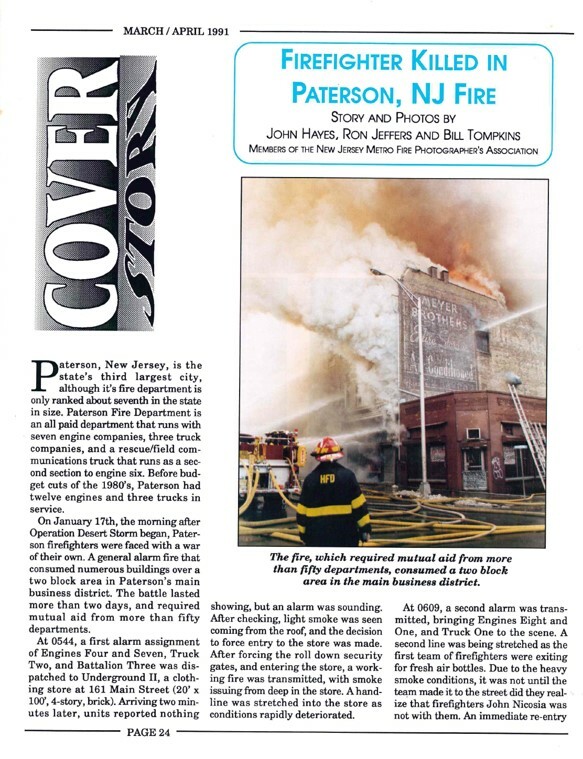 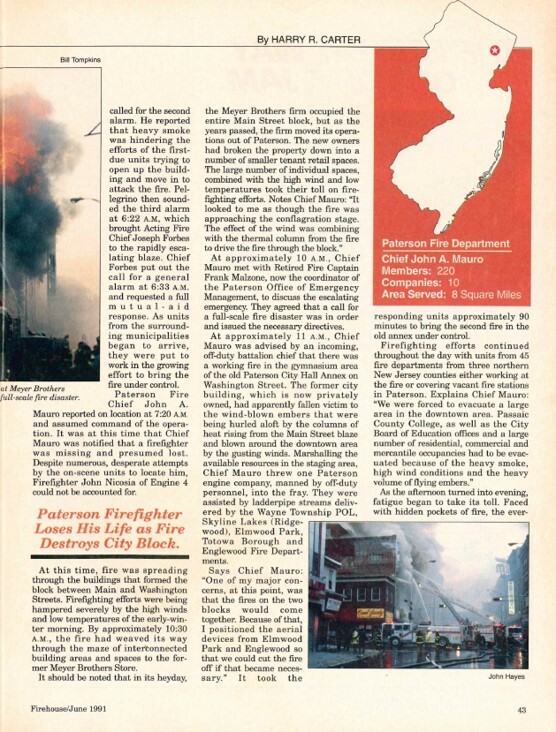 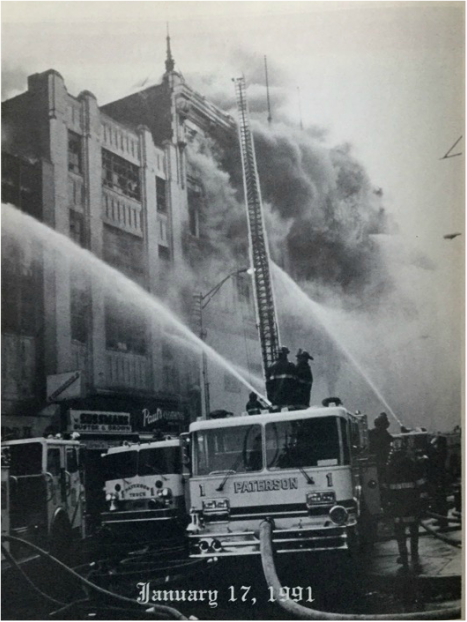 On Jan. 17, 1991, a general alarm fire broke out at 161 Main Street - the building that once housed the Meyer Brothers department store - and claimed the life of a Paterson firefighter. 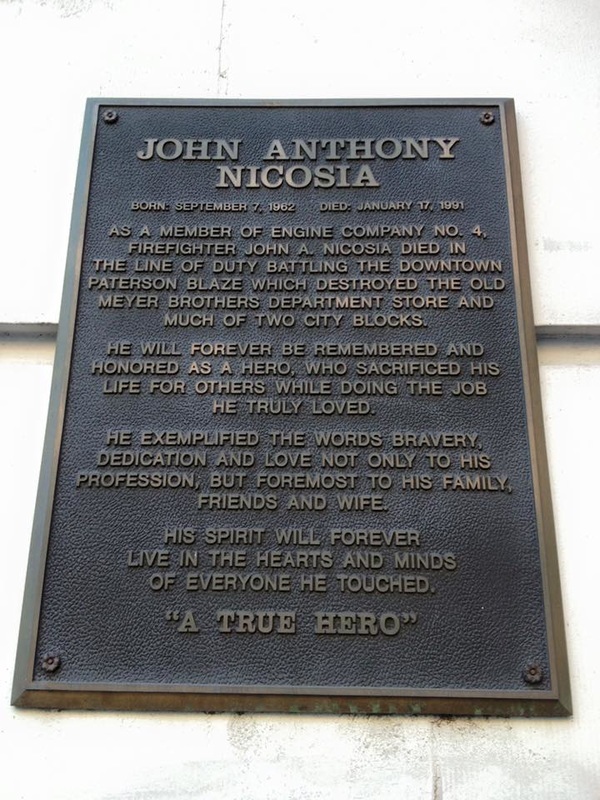 The body of John A. Nicosia, 28, a member of Engine 4, was recovered two days later. 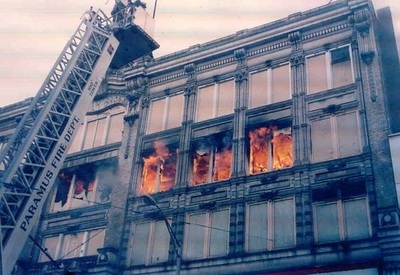 From the old department store, "the fire spread to a second building and there was a minor blow-out of windows and a large ball of fire," according to the U.S. Fire Administration. 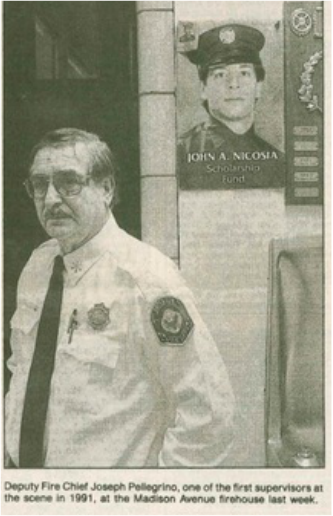 "There was a roll call and head count taken at this time and it was determined that Firefighter Nicosia was missing. 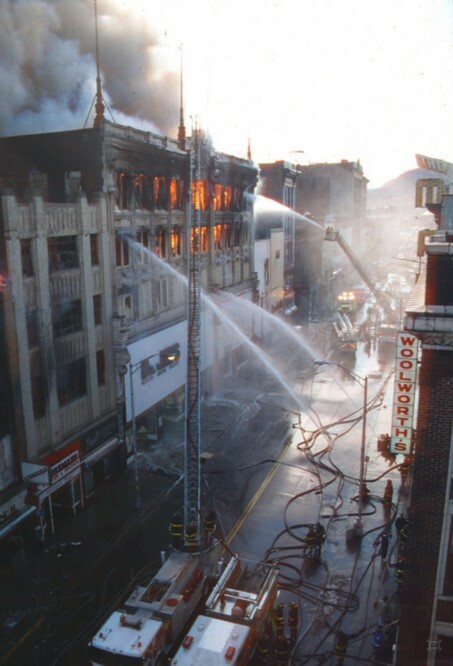 "Search and rescue procedures began immediately. 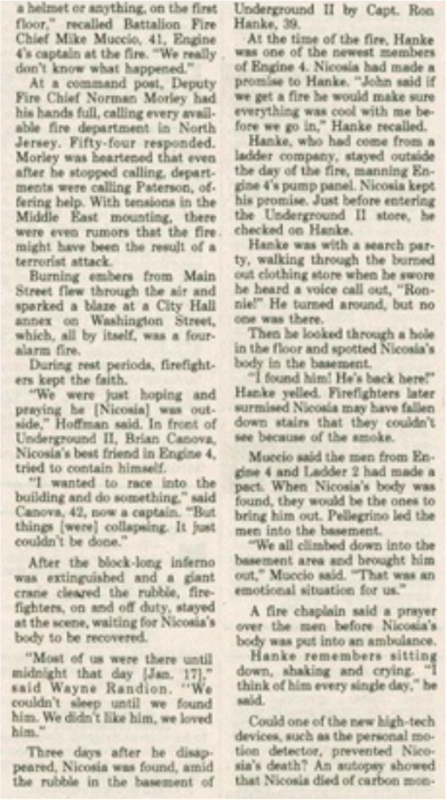 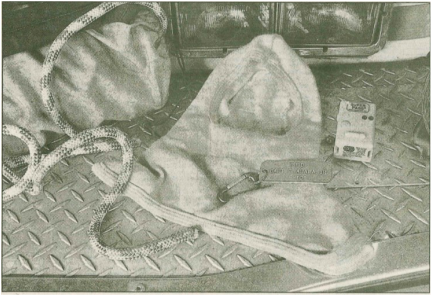 The search continued for two days until Firefighter Nicosia's body was found in the basement of the initial structure." A fire raged out of control throughout the day yesterday in downtown Paterson, N.J., destroying at least 15 stores and casting a pall of black smoke over the old industrial city of 149,000 people. 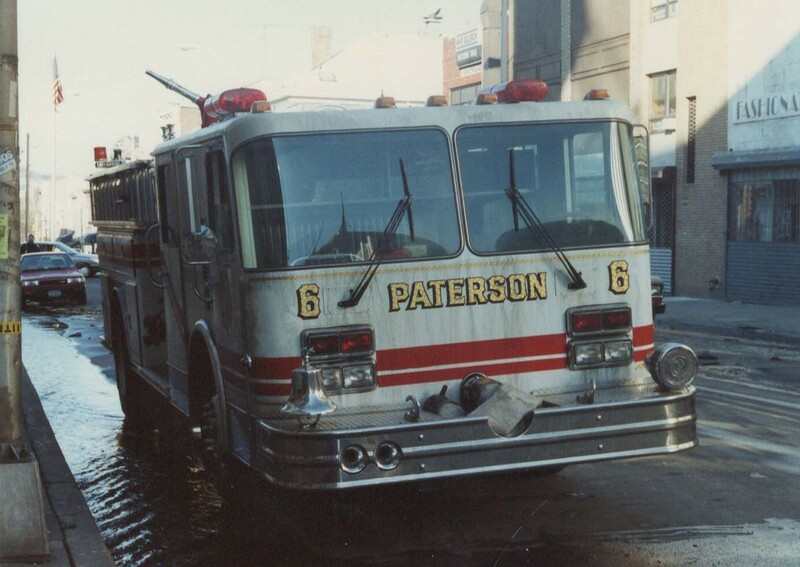 At 5 P.M., an exhausted Mayor William J. Pascrell Jr. said the fire "is contained but not under control." 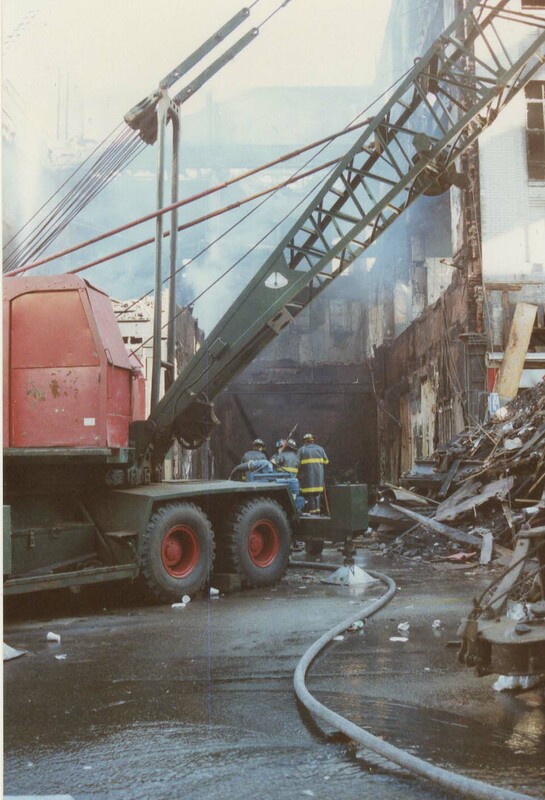 By late last night the fire still was not completely out. 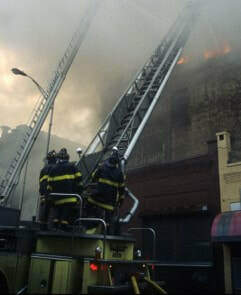 The search for a missing firefighter continued into the night along the block and a half of smoldering ruins. 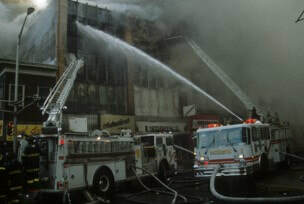 ​firefighters could not see even with their lights. 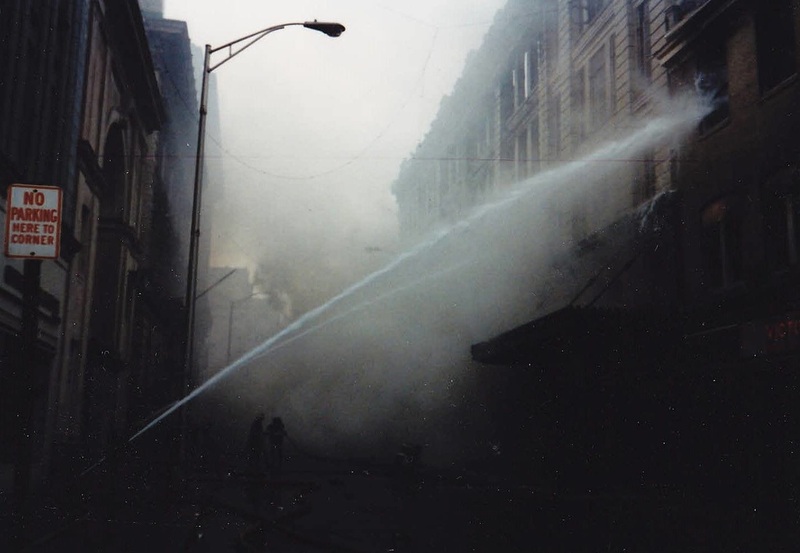 Officials did not know what caused the fire, which broke out shortly before 6 A.M. in Underground II, a clothing store at 161 Main Street in what had once been Meyer Brothers, a major department store. 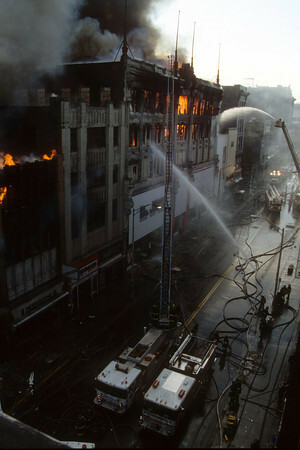 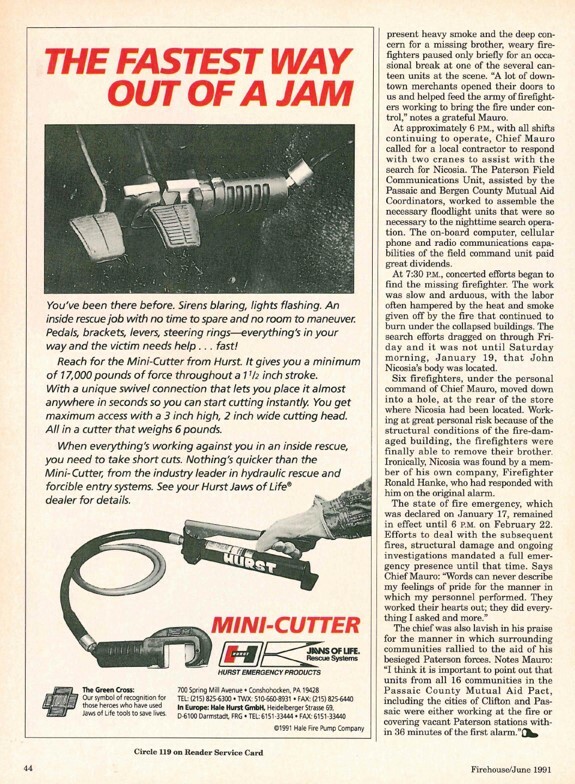 Whipped by strong winds, the fire spread rapidly up and down the stores lining the street. 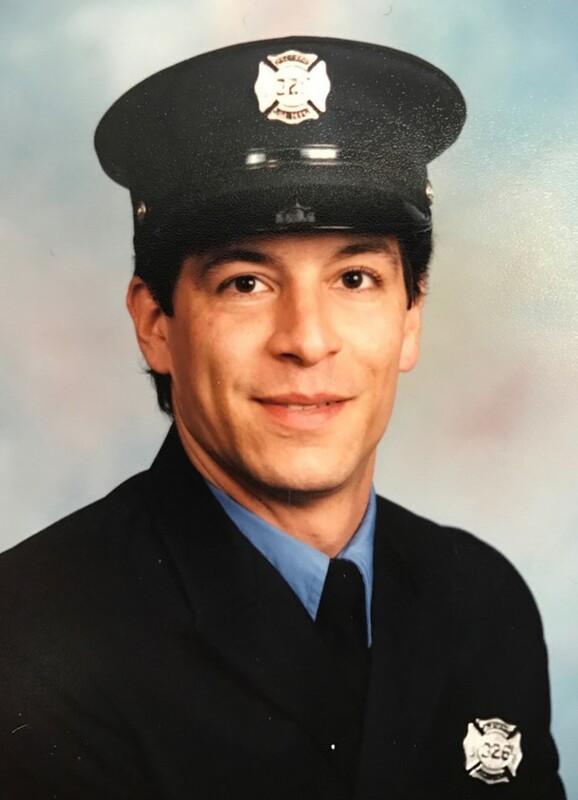 The missing firefighter, who was identified as John Nicosia, 27 years old, had entered the clothing store with several others, but failed to return when they were driven out by the heat and smoke, the Mayor said. 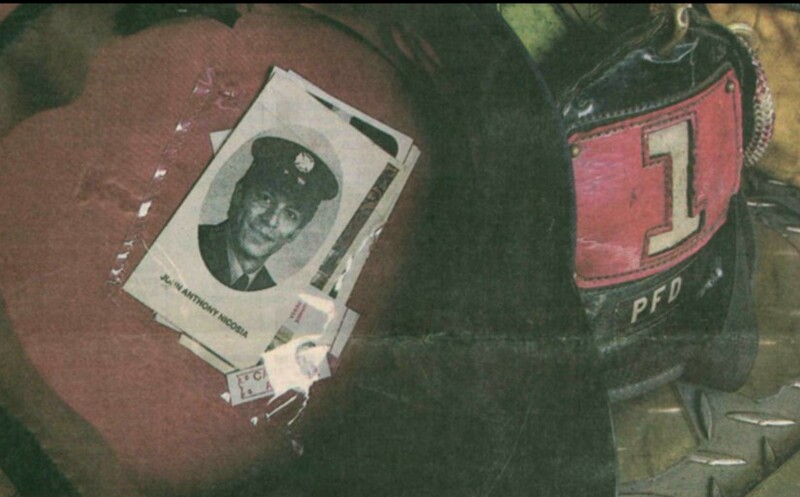 He had been a firefighter about five years, a fire official said. 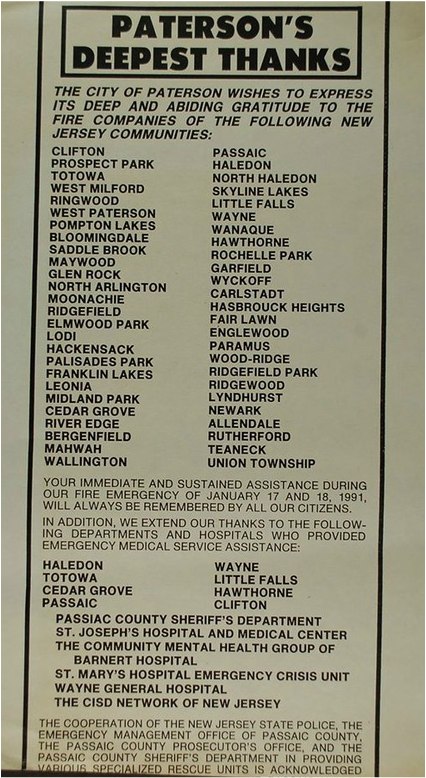 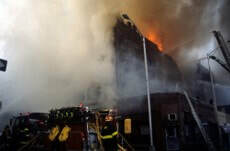 By midmorning virtually all of the city's firefighters were at the scene and calls went out to a dozen surrounding towns in Passaic, Essex and Bergen Counties for additional units. 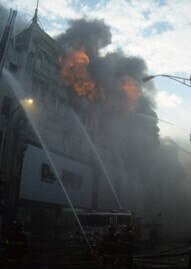 By midafternoon nearly 400 firefighters were at the scene. 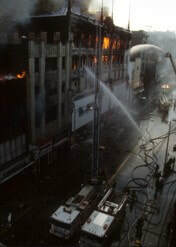 The fire did not threaten any residential areas. 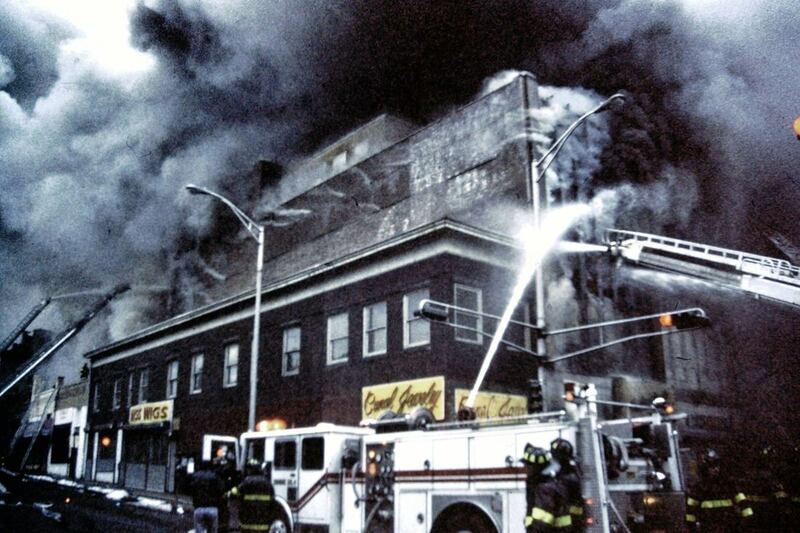 "That whole block is gone," said James Miller, the manager of the Furniture King on Main Street beyond the fire. "We were up on the roof before -- we're in a four-story building -- and we could feel the heat. 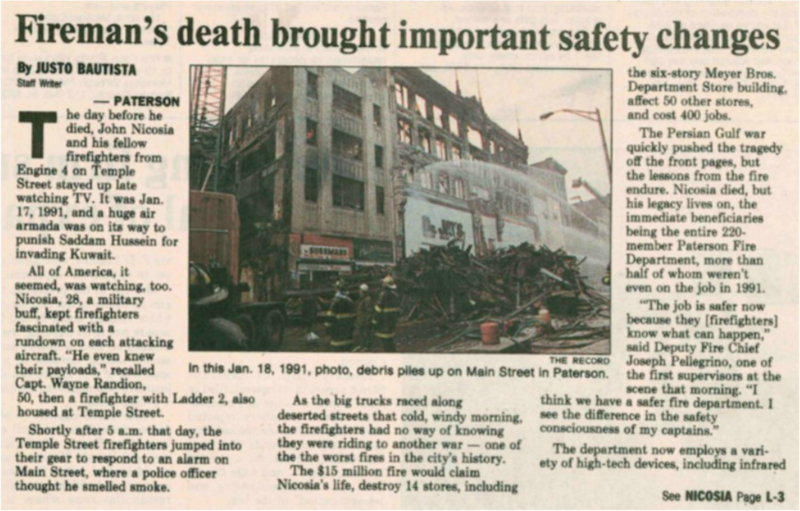 It was very, very intense." 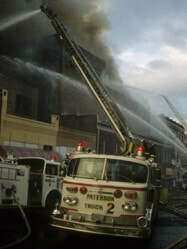 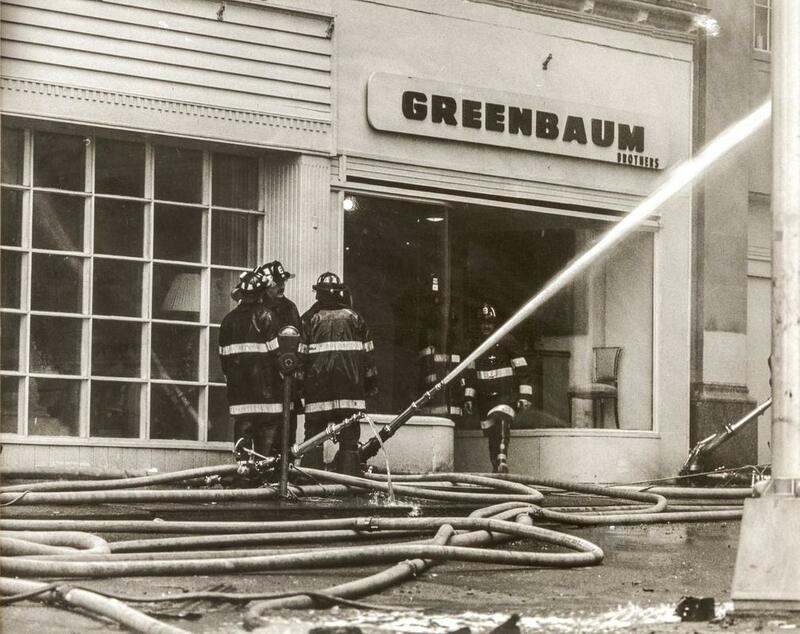 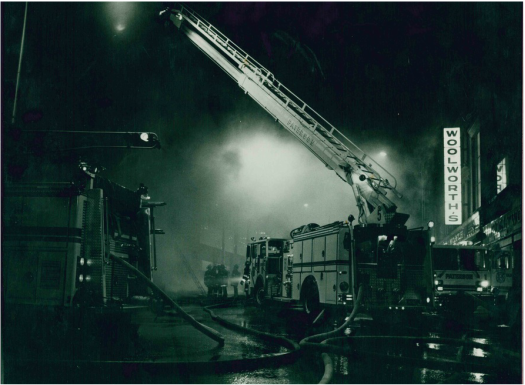 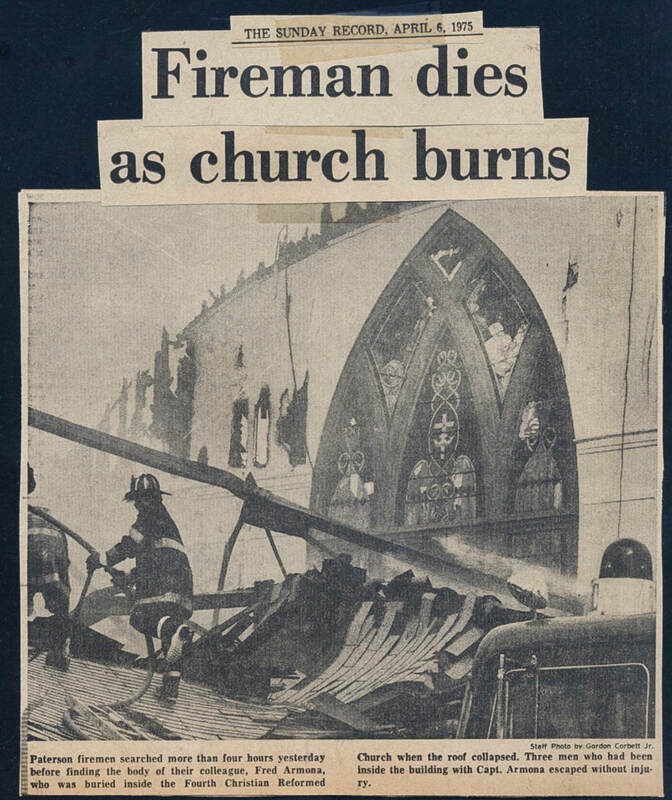 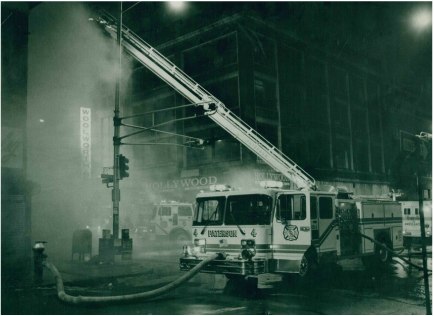 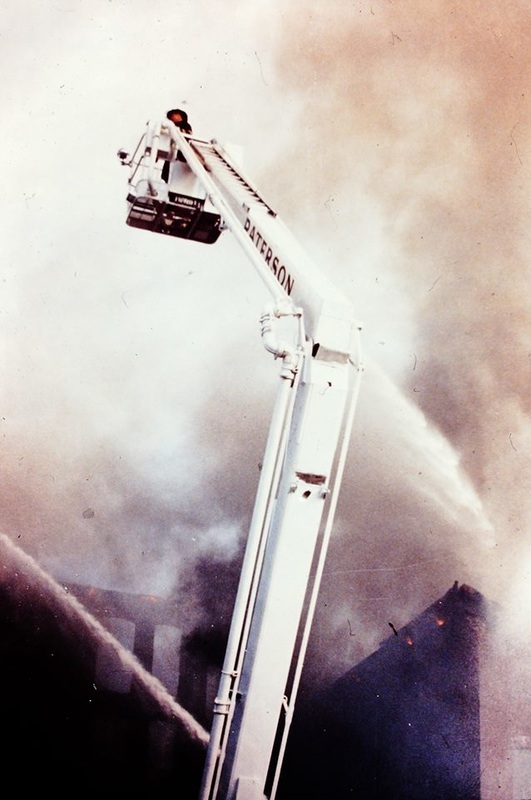 As the firefighters battled the blaze along Main Street, the fire ignited the roofs of other commercial buildings to the east along Washington Street, which continued to burn into the evening. 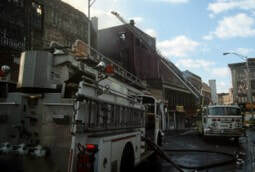 Several firefighters were treated for minor injuries and smoke inhalation. 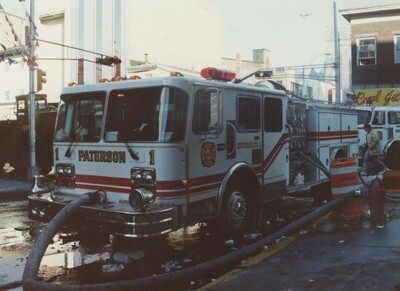 Mayor Pascrell was taken to St. Joseph's Hospital and Medical Center for treatment of smoke inhalation and released. 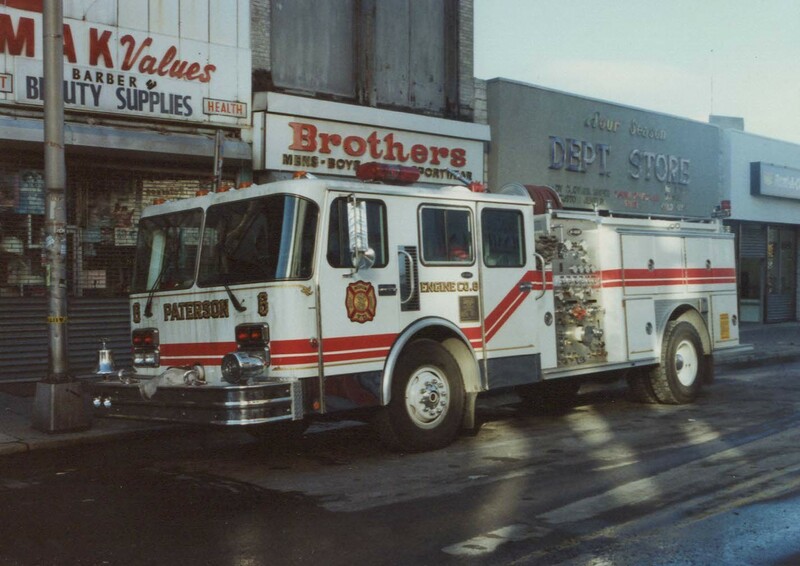 Mr. Pascrell said the initial damage estimate, not including the contents of the stores, was between $13 million and $15 million. 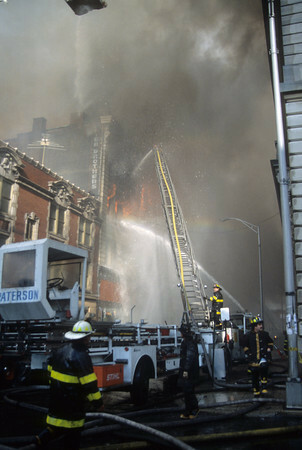 "We're talking about a major disaster here," the Mayor said. 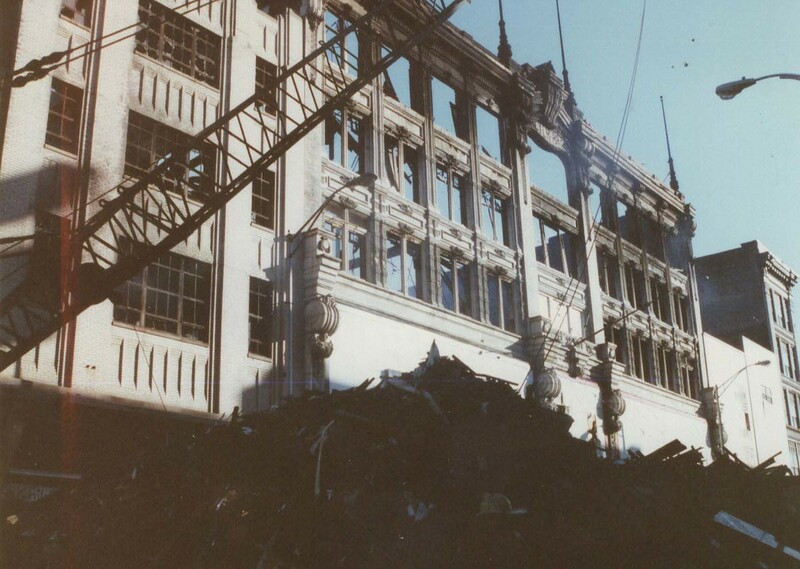 "It's devastating, but we'll come back."